Pension annuity providers have increase rates by up to 7% since reaching a low in August after a strong recovery in the 15-year gilt yields as investors expect interest rates to rise after the election of Donald Trump to President. The election of Donald Trump to US President has seen the price of bonds and gilts fall with the expectation of higher interest rates and inflation in the future. 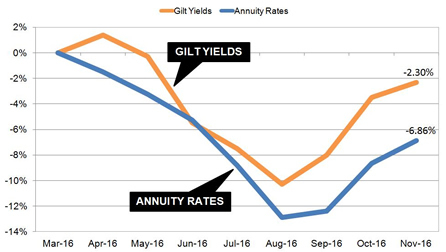 Annuity rates are mainly based on the 15-year gilt yields and a fall in the price results in a rise in yields which have increased 75 basis points from 0.98% in September to 1.73% today. a 75 basis point change would see pension annuities rise about 7.5% and providers such as Just Retirement, Retirement Advantage, Canada Life and Aviva have increased their rates by up to 7% since the August low. Investors are expecting a Donald Trump administration will include tax cuts and infrastructure spending promised in the campaign leading to inflation and higher interest rates. Providers have been quick to increase rates by up to 7% following a strong recovery of 15-year gilt yields as economic indicators from a variety of sources indicate higher inflation and interest rates can be expected in the short term. The above chart shows how yields and rates for our benchmark example have reduced since March 2016 ahead of the EU Referendum reaching a low in August and since then have recovered. Our benchmark example for a person aged 65 with £100,000 buying a single life, level pension annuity would receive £4,696 pa in August rising by 6.9% or £325 pa to £5,021 in November, of which a £298 pa improvement has occurred in the last six weeks. 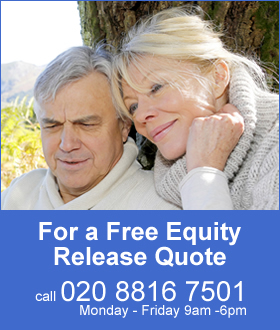 There remains a gap which suggests annuity rates can still improve by 4.56%. For the benchmark example in terms of lifetime income, the Office of National Statistics (ONS) would expect a male to live for 17.3 years and he will have £5,622 more over his lifetime. For a female she can expected to live for 20.4 years increasing her income by £6,630. The surprise victory of Donald Trump to President is likely to see higher infrastructure spending and tax cuts if he keeps to his campaign promises. Investors expect inflation to rise and already expected the federal Reserve to raise interest rates in December. Investors expect a higher payout if there is inflation during the lifetime of bonds and gilts to offset the reduction in real rates of return, hence lowers prices and higher yields. 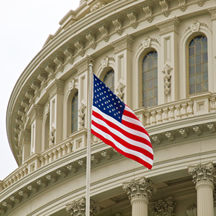 The change from monetary policy using quantitative easing to fiscal spending has been voiced in the US during the presidential campaign, the the UK by Chancellor Philip Hammond, in Japan and Europe. Donald Trump does not take the office of President until 20 January 2017 so 15-year gilt yields may remain at the current level or improve slightly up to the 1.90% yield just before the EU Referendum.